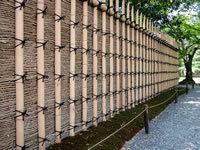 Bamboo fence building not only goes well with Japanese garden designs, it suits all kinds of garden landscaping. 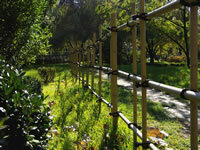 Japanese gardens often include fences that are made from bamboo. Not only are these fences structurally strong they can be designed and built to suit your garden whether it is small or large. If you like doing DIY (do it yourself) and want to build your own bamboo fencing, you should consider rolled fences with caps and moldings. Portable screens are also a good consideration for DIY bamboo fencing. When designing your project, and in assessment of quantities of materials, bear in mind that the canes will be varied. Some things to watch out for are; position of joints, cracks, colour, straightness, and taper. Round posts will match the bamboo better than square posts. Use a hard wood that is pressure treated for the fence posts that come into contact with the ground, up to 4" x 4" is advised. Using treated hardwood for posts is suggested because constant contact soil, particularly if wet, is likely to cause the bamboo to deteriorate after 3 to 4 years. It is said that treated hardwood posts are likely to last longer. It is recommended to cut canes with a hacksaw with a fine blade. Make your cut vertically or diagonally across the cane just above node joints where there is a membrane inside the cane, it will provide additional protection in helping to prevent water collecting inside. Bamboo may be likely to crack from nailing directly into it in the same way that wood can. To prevent cracking drill holes prior to nailing. Make the holes fractionally wider than the size of your nail and be careful when using a hammer to prevent the cane getting crushed. Nail guns or drivers can be used. Use of petroleum based preservatives or oils is recommended. For example hemp oil. As your fencing ages you may notice it changing colour and cracking through expanding or contracting with temperature variations and changes in weather or climate conditions through the years. The strength of fencing will not be affected by this natural process of ageing, it will provide character! 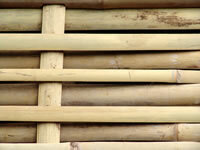 Bamboo fence building may not be suitable for you so consider hedges, windbreaks and screens grown from live plants. 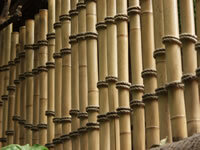 They make great alternatives to solid bamboo fence panels and can often be more effective in stopping the wind. If you grow a privacy screen, you can harvest some of it to turn it into a fencing panel or bamboo edging!